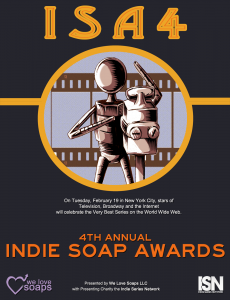 Indie Soap Awards. We’ve talked a bit about a them in the last few episodes and really spend some time talking about right off the top of this one. We celebrate Out With Dad and Husbands Indie Soap Award wins and also chat about whether the awards are being given to the most deserving, or the most popular. And does that really matter. Read this Tumblr post defending The Streamys, while still being upset at their lack of representation. What do you think? Should independent (i.e. non industry members) be judged against series with funding from major studios? Should webseries be given their own category in a larger awards ceremony like they are for the Canadian Screen Awards (being given out on Sunday BTW). Let us know your thoughts. And, on to the reviews! First we watched Super Knocked Up, Nick’s favourite pick from the Make My Series competition from a few episodes ago. We watched the entire first season, reviewed their show and then watched the season 2 premiere the very next day. Did we time that perfectly, or just exactly wrongly? They had to make a pretty big cast change between seasons 1 and 2, but have been doing lots of outreach with their new leading lady and they’ve won us over. And be sure to catch their weekly live Google+ Hangout show, Super Geeked Up on Wednesday nights. Next up we review the pilot episode of Out Of Time. We met lots of great people at the most recent Toronto Webseries Community Meetup, including Rodney V. Smith, the director/producer. He made a great case as to why we should watch and review his unavailable to the public series. Go, watch some behind the scenes stuff from their production diaries, drop a few bucks on them and get some goodies. And then go, listen to our episode, join us on the social medias – Twitter, Facebook, Google+, iTunes and write something to us at backtalk@limitedreleasepodcast.ca! By the way, we had an amazing response from John Cabrera, writer of H+ The Digital Series on our Google+ page. You should go read it, especially if our review of the show turned you off watching their series.